NOTICE: Activation key must be used on a valid Steam account, requires internet connection. ABOUT THE GAME	Pew Pew Pew!!! 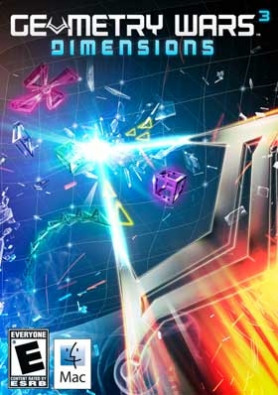 Enjoy the next chapter in the award-winning Geometry Wars franchise and battle through waves of enemies on 3D grids in this frenetic arcade shooter!KEY FEATURES Over 50 single player levels including Adventure and Classic Arcade modes 3D grids and over 10 battle modes … including Pacifism, King and Claustrophobia 4 unique companion drones such as Attack, Collector, Ram and Snipe Cooperative and Online Competitive Multiplayer modes Community and Friend LeaderboardsSYSTEM REQUIREMENTS Mac: Minimum: Operating System: 10.9.4 (Mavericks), 10.10 (Yosemite) Processor: 2.2GHz Intel Core 2 Duo (Dual-Core) Memory: 4 GB RAM Hard Disk Space: 1 GB Video Card: ATI Radeon HD 3870 / NVIDIA 330M / Intel HD 4000 Peripherals: Geometry Wars 3: Dimensions supports the Apple Mouse and Keyboard, PlayStation 3 DUALSHOCK 3 and PlayStation 4 DUALSHOCK 4 wireless controllers, as well as wired Xbox One and Xbox 360 Controllers for Windows. Linux: Minimum: Operating System: Ubuntu 14.04 Processor: Intel Core 2 Quad, AMD Phenom II X4 Memory: 4 GB RAM Hard Disk Space: 1 GB Video Card: ATI Radeon HD 5570 / NVidia 260 / Intel HD 4400 Peripherals: Geometry Wars 3: Dimensions supports the Apple Mouse and Keyboard, PlayStation 3 DUALSHOCK 3 and PlayStation 4 DUALSHOCK 4 wireless controllers, as well as wired Xbox One and Xbox 360 Controllers for Windows.